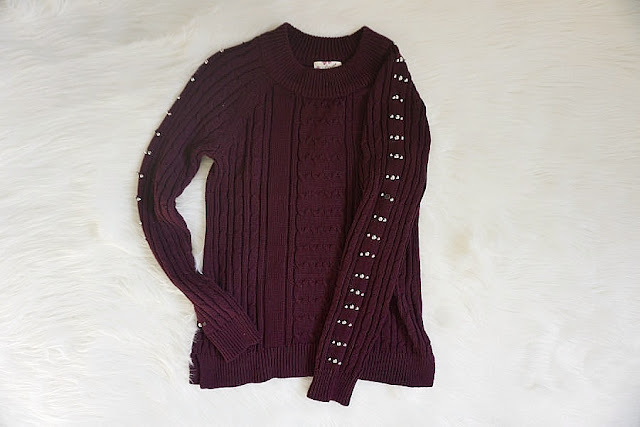 xo ♥ amela: Sweater Weather! This first sweater I recently bought from Rue21 is called the Laced Sleeve Rib Knit Sweater. I am absolutely in LOVE and had to get it because of the details on the sleeves. I am a sucker for bows and ribbons and when I saw this, I had to immediately put it in my basket. The only available color is black and it's a pretty thick sweater. 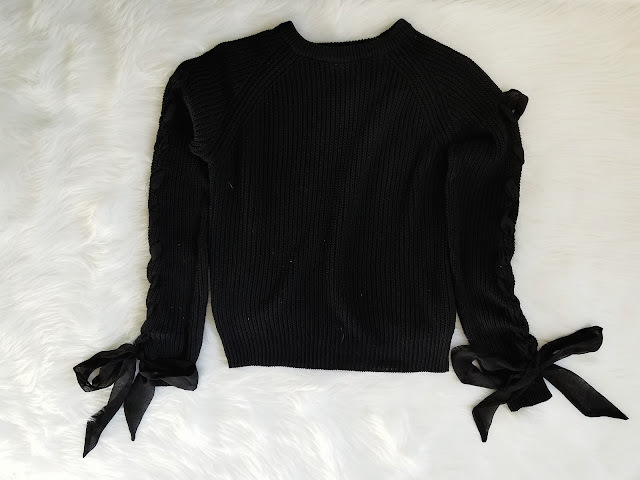 The sides of the arms are laced in ribbon in a cute pattern and meet up at the bottom to form a bow. The bow does hang beyond my hands but in a way, it hugs it and just looks adorable. The sleeves are longer than the actual sweater. I ended up going a size up for this and it ended up fitting me perfectly!The only thing that was a downside is that I ended up wearing this sweater for the first time to Olive Garden with my boyfriend, and my sleeves kept getting dipped in the Chicken Alfredo sauce so I had to pull up my sleeves while I ate. 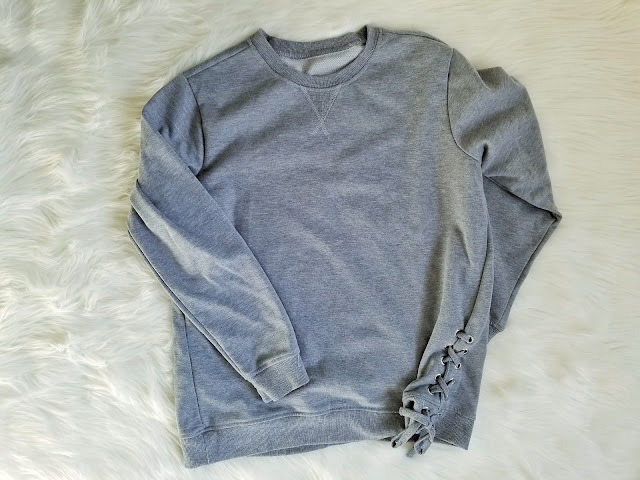 This gray sweater is also from Rue21, however unfortunately, it's no longer available. I bought it over the summer when it was on sale and I'm glad I did because I absolutely love this sweater. I went a size up on this one as well, just because I love my sweaters to be big on me. The side detail is what drew me in because it has the cross stitching that is really in this year. This sweater is big enough that I consider it a tunic sweater because it does go down fairly low when I wear it. It's super warm and a medium size thickness. 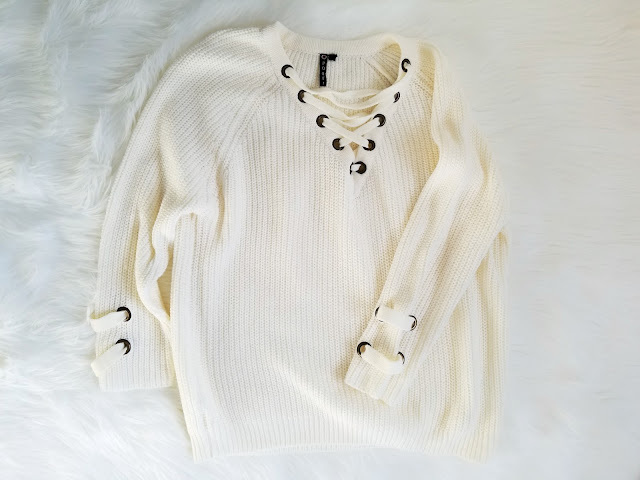 I ended up getting this Ivory Lace Up Grommet Sweater from Rue21 as well. (sorry, they had a sale!!) This is available in the color Ivory or the color Pink. I chose to go with Ivory. This sweater is a thick, chunky sweater. The details on the arms really drew my eye. It has four rings with string going through it. I chose this picture so you can see the detail at the end. I love the detail at the top, also, because it matches the arms but doesn't over-do it. The sleeves look shorter here, but I assure you that they are not. They fit me perfectly. This sweater was very warm to swear at the office. I had a jacket over it, since it was snowing that day, but quickly took it off and wore just this. It kept me warm and stylish throughout the whole day. They also have a dress version of this sweater and I think it may be my next purchase! This last Rue21 purchase is one that I've talked about in a previous post. I decided to finally purchase it and I love it. It's unfortunately unavailable on the Rue21 website. :( I don't know how I would feel about this whole 'cold shoulder' on sweaters thing, but I guess you can say I'm still getting use to it. I'm someone who's always cold. Wearing this, I'm not gonna lie, it made me cold at the beginning of the day so I had to wear a light sweater over it. As the day went on, I began feeling warmer so I took my sweater off and it was the perfect temperature to wear it. I think when we have those warm days in November, this would be perfect to wear; Maybe around 60 degrees or so. The ruffles across the chest area and below shoulders is my favorite part because it brings detail to the sweater, but not too much that it's overpowering it. The color is a blush pink so it's not drawing too much attention and I love that. 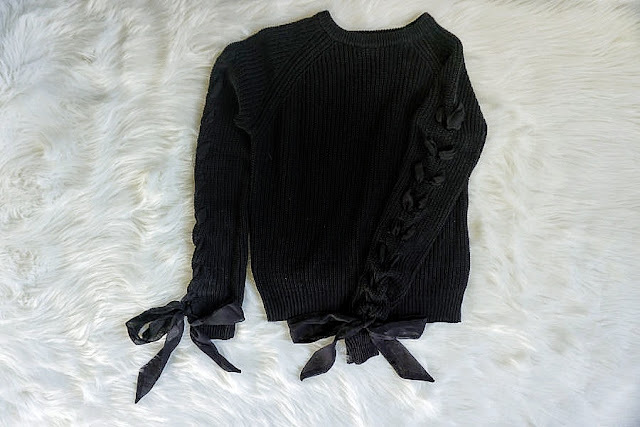 This sweater (SO® Lace-Up Tunic Sweater) is from Kohl's. I purposefully scrunched up the ends to show you the details. This sweater I ended up buying in store because I had Kohl's cash. It's a very light-weight sweater and to be honest, it's very see-though. 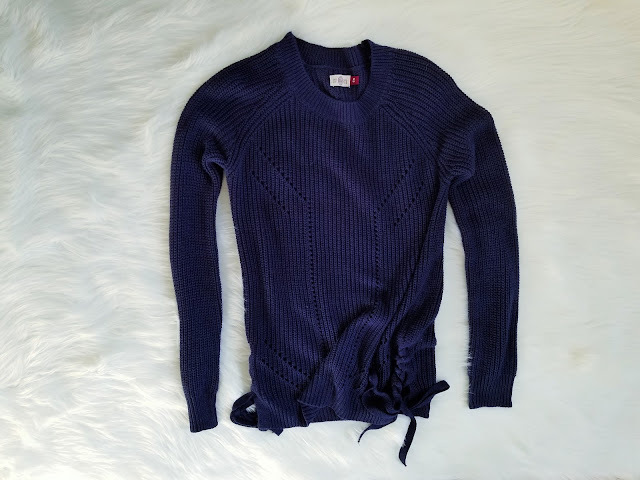 I bought the sweater in the color 'Blue Crest' and I noticed when I wore a white tank top underneath, that you could see the entire tank top, so I ended up switching it to a black tank top and it was not noticeable at all. It's very cozy but not as thick as other sweaters. Since I was in store, I was able to see the sweater and it's fairly large. I usually wear a size medium so I bought it in medium and I thought it fit perfectly. If you like your sweaters to be tighter, I suggest getting a size down. It is a tunic sweater, so it will be longer than regular sized sweaters, which I prefer because I usually like to wear leggings with my sweaters. The details on the side show that it's a laced. Unlike the gray one, this one is laced on both sides, however, there are no rings, it's laced just with string. I think it's absolutely soft and warm and can't wait to wear it again! This final one is my most recent purchase. The picture makes the sweater look odd, but trust me, it's super cute. I found it at Marshall's for $16.99!! They only had size small left in this color so I decided to get it. (It was either this or black and I have too many black sweaters as it is! lol) The details on the sleeves is what really drew me to it. it's three little half-pearl-like studs that are sown into the sides of the sleeves. This goes all the way from the top to the bottom of each side. The sweater is fairly thick so I would wear it if it's cold outside. This is not a tunic sweater, so it will be regular sized. I'm a total grandma and love wearing sweaters but I also want to be fancy so this sweater is what represents me. lol. I love that it's purple because I don't have many purple clothes so I decided to step outside my comfort box for this one. 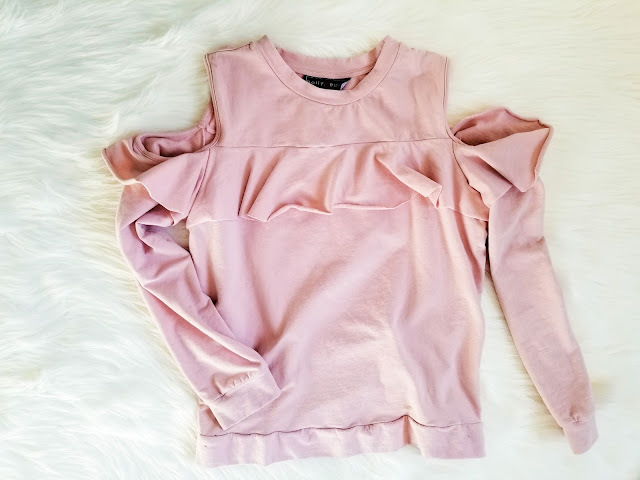 Do you know of any cute sweaters and where we can find the best deals!?! ?